We created a �catwalk� sized 2.5m long and 90cm wide, with 10cm heightened borders (in order to avoid any accidents while a wheelchair is on its way in or out). There is a rail on one side that supports walking persons. This catwalk can also be used for another purpose: it can help the guest to slide into the sea, or, reversely, to get back into the yacht. 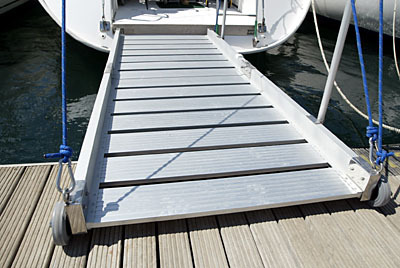 Someone who is not strong enough, or is disabled, will be able to sit on the half-sank board, enjoy the sea, and then be lifted back on the yacht together with the board. 4-point safety belts are installed on the lounge and keep the passengers stable and safe from any unwanted forward or left-right movements of the boat in case of bad weather. On the couches of the lounge, our guests are also protected from the cold/heat spraying/wind while enjoying a panoramic view of the sea and participating in all activities with their friends. The roof can slide open and allow sunbathing from the same position. The tables in the lounge can host 8 persons, and a board fits between them for easy access by wheelchair users. There are handlebars surrounding the yachts and all its areas that allow people with instability in walking to make their way with safety without a risk of stumbling. Each boat carries two aisle-chairs of our own pattern to allow easy access to the cabins and the restroom-where normal wheelchairs do not fit-, and a special lift to help people with more serious disabilities transfer from their own chairs to the aisle ones. These special-made chairs go to the lower level where the cabins are via a special platform (created with the highest safety standards), which is operated electronically. 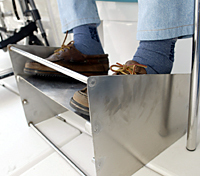 The restrooms of the yachts have special handlebars installed to fit all the needs of our guests. Both the restrooms and the cabins can be also accessed with a lift that helps people with a more grand disability. The yachts have also immense storing capacities, and can house all the luggage and equipment of our passengers. There is also a special barbeque with lava stones, and we very often arrange barbeque nights with our captains that can also entertain our guests with music (guitar/accordion). The entertainment of our guests is also enhanced with the on-board television and DVD player. We are set and ready to offer the best vacations to people with disabilities, and we are proud to be among the very few around the world that arrange this kind of vacations- with sailing yachts. Of course, this is a continuing attempt, and we will keep on further adjusting our yachts in order to perfect them.